Abstract: Airwheel Q5 model is the new and portable electric unicycle for the new year. It is equipped with SONY battery to guarantee the travel distance, and it is also very powerful with upgraded motor. It is not only a nice designed model but also very functional and useful, which makes the Airwheel Q5 the best choice for the new year and give you a totally new riding feeling. As the world-wide know brand, and with the increasing popularity of this new portable intelligent transporter, Airwheel intelligent scooter is noticed by more and more people. This new portable transporter can meet your daily travelling requirement, and can bring you lots of fun at the same time. It can also help you practice your muscle and improve your sense of physical coordination. This Airwheel Q5 2-wheeled electric scooter is published in September of 2014. It is one of the best sold model in the later half year 2014 both at home and abroad. What makes Airwheel Q5 electric unicycle so different from others and what makes it the best seller? SONY is one of the best battery brand in the world. In order to make sure about the quality and make sure it can travel longer distance and be more powerful, Airwheel Q5 is equipped only with SONY brand battery core. Besides the powerful and long lasting battery, safety is also the top concern to many buyers. This top brand SONY battery will make sure there will be no danger of electricity leaking while charging. Q5 self-balancing electric unicycle is powered by an ultra-quiet Mag-lev motor, which is lighter and more powerful than regular brushless motors and delivers more smooth and powerful riding experience. With little noise in operation, you can ride Q5 in public or work places. Another advantage of this Mag-lev motor is that it reduced the abrasion and wastage of the accessories thus make the motor life last longer. The Airwheel Q5 with this Mag-lev motor can be used for more years. Airwheel launched the latest Q5 as the flagship model. Regarded as a mature and premium version, Q5 features exciting update and innovation: the extended pedal and latest driving system and LED atmosphere lights, all for the best rider experience. The extended pedal will help you fell more comfortable while standing on it. This new added LED light design will also help improve the safety of riding as you can easily be seen by others at night. Airwheel keep on designing and improving to make sure that the Airwheel electric unicycle will perform the best. As a flagship model, Airwheel self-balancing electric unicycle is very unique and cannot be replaced. 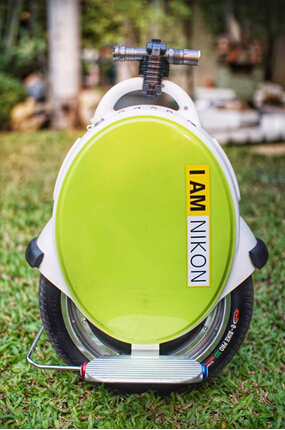 It is loved by both new buyers and Airwheel lovers who owned one electric unicycles already. The improved features of Airwheel Q5 make more people want to own one and fell more safe while riding it. Next：Intelligent scooter Q3, 스스로 균형을 잡는 !